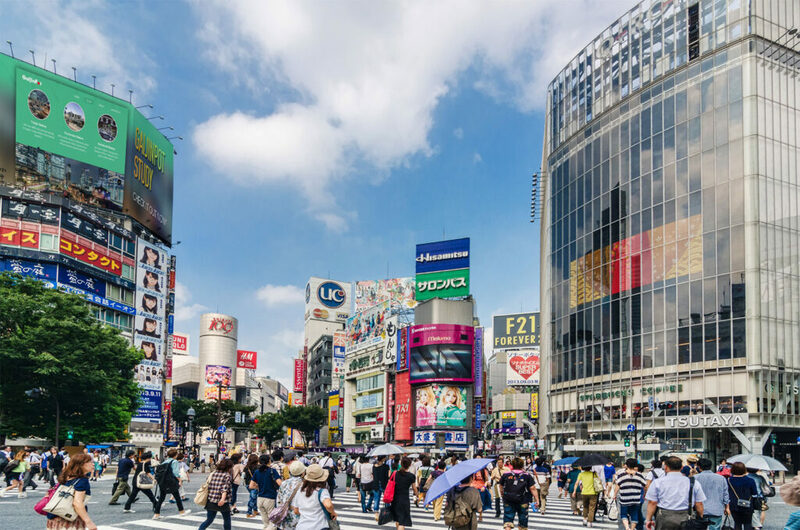 With one of the most iconic street crossings in the world, Shibuya Station is a large shopping and entertainment area. Shibuya Station渋谷駅・しぶやえき (渋谷: 渋 – astringent 谷 – valley) While the origins of the name ‘Shibuya‘ varies, one possible theories is that back in the Heian era, a samurai family called Shibuyake controlled the area. Today Shibuya Station is the third busiest station in Japan in terms of the number of 歩行者ほこうしゃ・passengers passing through it each day. The famous pedestrian crosswalk on Shibuya Station’s west side has become synonymous with the busy lifestyle of Tokyo. Shibuya is one of the best places in the world to go shopping so bring some money, lots of it, and go crazy! Center Street, directly in front of you when you cross the pedestrian crossing – to the left of the building with the video screen and スターバックスStarbucks, is for pedestrians only and is the home of youth fashion. Here you will find hundreds of clothing stores, boutiques salons, game centers, music stores, restaurants and night clubs. If you are a fan of used books, ブックオフ・渋谷ぶっくおふしぶや・Book Off Shibuya, is a must visit to shop for used books that are still in like new condition. Besides Center Street there are also the massive Tokyu, Tokyu Hands, Parco, Seibu and Loft department stores. Everything from 服ふく・clothing to stationary, electronics and household goods can be found at these stores. Once you’re finished shopping, or if you just want to take in some culture, go back to the pedestrian crossing and walk west until you reach the Bunkamura文化村・culture village complex right next to the main Tokyu department store. Here you will find the オーチャードホールOrchard Concert Hall which has an extensive list of concerts, operas, ballets, and musical dramas, and the Bunkamura (文化村、bunkamura) Museum of Art, acclaimed in Japan and abroad for their themed exhibitions. No matter what your interests you’ll find something here to indulge them. Shibuya Station is also home to one of Japan’s most famous dogs. Hachikoハチ公・はちこう, the name sake of Shibuya Station’s west exit, was an Akita belonging to Professor Eisaburo Ueno of the University of Tokyo. Professor Ueno adopted Hachiko when he was just a puppy and so close was the bond between them that Hachiko would walk Professor Ueno to Shibuya Station every morning, and every evening, Hachiko would come back to Shibuya Station and wait for him to arrive home from work. In 1925, when Hachiko was 2, Professor Ueno passed away at work never to return home. Loyal as ever, Hachiko dutifully returned to Shibuya Station every evening to wait for his master until he passed away in 1935. The statue of Hachiko that stands in the square at Shibuya Station today was built in 1934 and inaugurated in the presence of Hachiko himself.